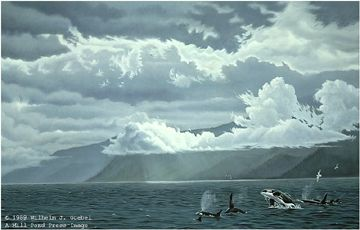 Wilhelm Goebel Limited Edition Paper Print:"Straight Course - Orcas"
Image Dimensions: 18" x 28.63"
About the Art: It is observation in the field that fuels Wilhelm Goebel's creativity. From nature's complexity of colors, values and shapes, he selects his individual point of view and strives to convey the feeling that impelled him to paint. Goebel sees his work as an interweaving of his knowledge of his craft with glimpses of his vision. Goebel received his bachelor's degree in biology from Ithaca College, a field of study that has well served his artistic talents. Public recognition of Goebel's artwork came early in his career. The first exhibit of his work was at the prestigious Leigh Yawkey Woodson Art Museum's 1982 Birds in Art" show - an impressive achievement for the young artist - where his painting was selected and hung alongside those of some of the world's finest contemporary wildlife artists. Goebel's paintings have since been shown in several of the museum's annual exhibitions and tours. Goebel's first one-man show, entitled "Avian Images," was hosted by the Laboratory of Ornithology at Cornell University in 1982. His art has subsequently been featured in many group exhibitions. Goebel has won numerous stamp and print program competitions, including the 1985 Illinois Salmon Stamp, the 1985 Delaware Trout Stamp and the 1983 Long Island Duck Stamp. He was New York State Ducks Unlimited's "Artist of the Year" in 1984 and was a finalist in both the 1984 and 1987 Federal Duck Stamp competitions. Goebel's field work remains his primary source of inspiration. "From a confusion of elements, the artist must choose only a few things with which to create a painting that will convey, he trusts, something of the feeling which impelled him to paint."